Henry attended his team building seminar last weekend and I seized the opportunity to spend a weekend in Tayabas. Nanay has started her re-painting project a week ago so our house still reeked of paint fumes. After meeting my titos and titas and lunch, we headed to Graceland where we will spend the night. 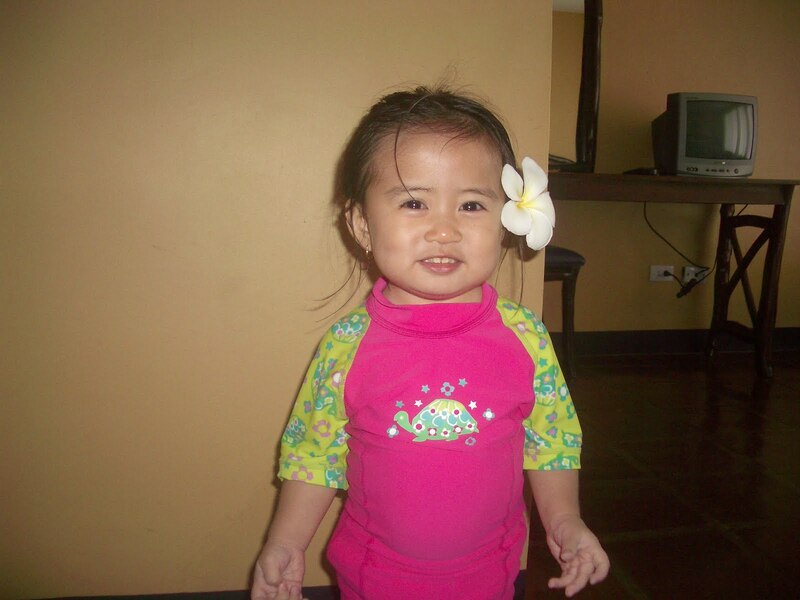 As soon as we stepped in the hotel room Iya started requesting to go to the pool. So para masulit we went to the pool for an afternoon swim. Iya became tall enough to walk in the kiddie pool and was shrieking with delight because finally she can pretend to swim without my binding hands. I tried the slide and screamed like a baby! I hate feeling out of control! Luckily there is only one kid there, who is braver than I am, who saw me. Julia knows how to tease and splash the water on my face. I think we spent more than two hours wading. And we were so wrinkly like raisins when we got out. After our swim we took this picture with calachuchi in her hair. And when we are all cozy under the comforter, she said she wants pansit. Wow! my baby is already making requests! So I called room service and asked for pansit lucban. Yum! We watched tv, told stories, and snuggled in bed. She did not even take a nap. She was excited to swim again! But because it rained so hard, we opted to stay in the room. We ate sinigang na bangus sa miso for dinner and called it a night. LITTLE OSANG NA SYA!!! SUPER ADORABLE!!! gah. nakakagigil!! !